If your website features a username+password authentication system, you owe it to your users to offer 2-factor authentication (or 2fa for short) as an additional measure of protection for their accounts. If you're unfamiliar with 2fa, it's that step in the login sequence that asks the user for a (typically) 6-digit numeric code in order to complete user authentication. 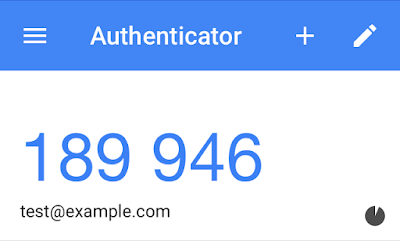 The 6 digit codes are either sent to the user's phone as a text message upon a login attempt or generated by an app such as Google Authenticator. Codes have a short validity period of typically 30 or 60 seconds. This tutorial will show you how to implement such a system using java in a way that is compatible with Google Authenticator. Other compatible 2FA apps should work too although I haven't tested any others against the code in this tutorial. Your first idea for implementing the server side component of a 2fa system might be to randomly generate 6 digit codes with short validity periods and send them to the user's phone in response to a login attempt. One major shortcoming with this approach is that your implementation wouldn't be compatible with 2fa apps such as Google Authenticator which many users will prefer to use. In order to build a 2fa system that is compatible with Google Authenticator, we need to know what algorithm it uses to generate codes. Fortunately, there is an RCF which precisely specifies the algorithm. RFC 6238 describes the "time-based one-time password" algorithm, or TOTP for short. The TOTP algorithm combines a one time password (or secret key) and the current time to generate codes that change as time marches forward. RFC 6238 also includes a reference implementation in java under the commercial-friendly Simplified BSD license. This tutorial will show you how to use code from the RFC to build a working 2fa system that could easily be adapted into your java project. Let's get started. Go https://tools.ietf.org/html/rfc6238 Appendix A and cut/paste the java code that is the reference implementation into a file called TOTP.java. Don't forget to remove the page breaks so you'll have valid java code you can compile. Note: The reference implementation isn't contained in a package, which means it cannot easily be imported from other java packages. I recommend creating a package called org.ietf.tools (from the RFC domain name as per java package naming convention) and moving the TOTP class into it. The groupId, artifactId and version should work with your non-maven dependency management tool of choice too, e.g. gradle, ivy, etc. Go ahead and open up the Google Authenticator app (free in the App Store) on your mobile device and press the little plus sign near the top right to add a new entry. Select manual entry. (Don't worry, we'll add support for the more convenient "Scan barcode" option too shortly). In the account field, put in a test email address, and enter your generated secret key under "Key". Leave the "Time based" toggle in the default on position. Click the checkmark in the top right to complete the addition of your new entry. 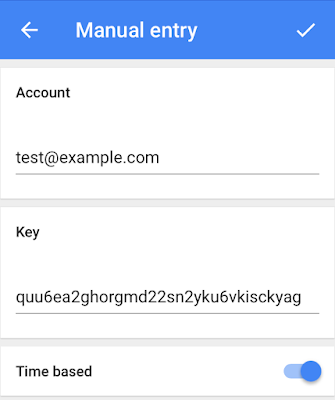 You should now see your test entry appear in the Google Authenticator UI with a 6 digit code changing every 30 seconds. Now let's write a method that converts base32 encoded secret keys to hex and uses the TOTP class we borrowed from RFC 6238 to turn them into 6 digit codes based on the current time. If you've wired things up correctly, you should should be able to run the above loop and see the same 6 digit codes being printed by Google Authenticator and your java code in unison. And you should experience that warm & fuzzy "Cool, it's actually working" feeling that programmers get when things go right. If the example isn't working, double check that you've used the same secret key in your test code as you manually entered into Google Authenticator and that you didn't miskey it when you typed it into your phone. Also, validate that the clocks are correct and in sync on your computer and phone. After all, these 6 digit codes are time-based. Account is the user-facing id on your system, typically a username or email address. 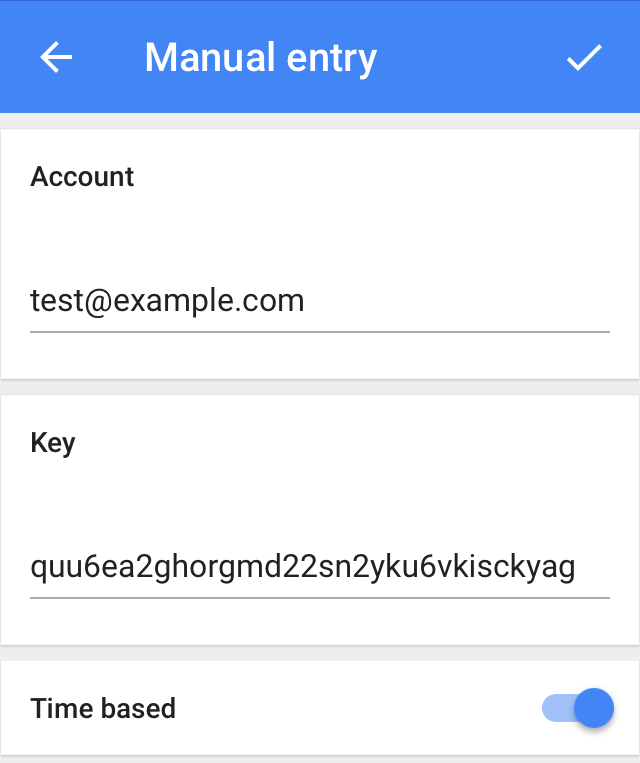 It's used to label entries within Google Authenticator. Issuer is a company or organization name and is also used for labelling purposes. Issuer appears twice. It's not a typo. The docs recommend putting this value in 2 places. All dynamic values must be URL encoded. The colon can be a literal colon or may be url encoded as %3A. Google Authenticator doesn't seem to deal with spaces encoded as plus signs gracefully. Encoding spaces as %20 seems to work. 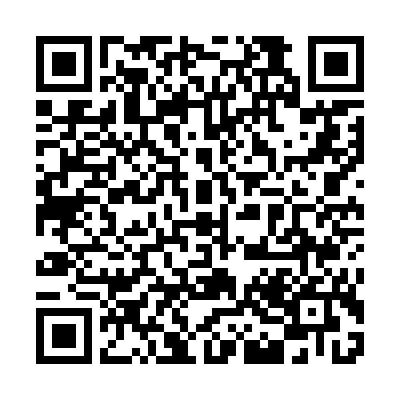 Go ahead and try to use your generated image with the "Scan barcode" option you saw previously in Google Authenticator. 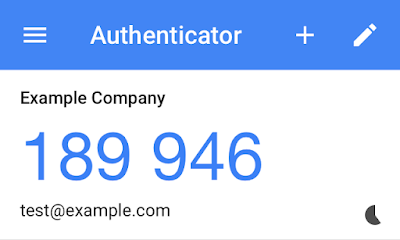 If all is well and right in the programming universe, you should now have a new entry within your Google Authenticator app that was created from the PNG image you generated and produces the same 6 digit values at the same time as your manually keyed in entry and your java code. Notice this time the issuer appears at the top; a nice touch that we get with the barcode scan, that we don't get with manual key entry. If it works, congrats! It's time to do a victory lap. If not, please double check your code against the demo code for this tutorial on GitHub. If you're still having an issue after that, please leave me a comment as I'm sure it's all my fault and I'll do my best to help you get your example code working. 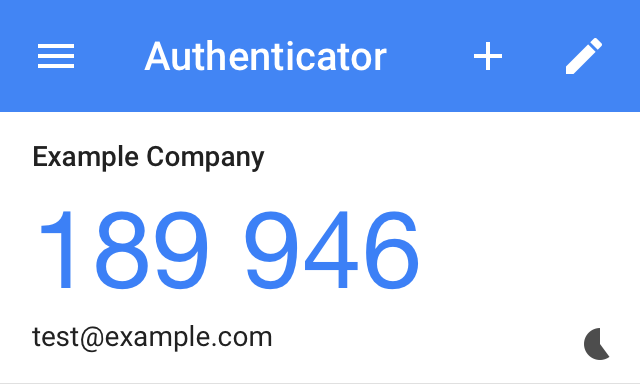 Now that you've got the nuts and bolts of 2fa and Google Authenticator integration working, it's up to you to integrate these snippets into your own website or app. I'll leave the mundane MVC details to you. Don't forget that some of your users will inevitably lose their phones and be locked out of their accounts. So you should provide your users with the ability to generate about 10 one-time use backup codes that can be used for logging in case of an emergency. You can use a method similar to getRandomSecretKey() above to generate cryptographically secure one-time use backup codes. In order to defend against brute force attacks, be sure to apply rate-limiting on any endpoints you expose that process 2fa requests. Also, it's a good idea to invalidate tokens once they are used to prevent replay attacks. And finally, this should go without saying, but always use a secure https connection! Another rather neat application of the code snippets presented here is in integration testing. You can use the getTOTPCode() method above in a Selenium test for your site's 2fa login system or even social logins with Google, GitHub or any other site supporting TOTP-based 2fa. All you need is the manual entry version of the secret key string. I've released all code in this tutorial on GitHub under the same commercial-friendly Simplified BSD license used by the reference implementation within the RFC. So now there is nothing stopping you. Go forth and make your users more secure! After a protracted quiet period, I'm rebooting my blog. Applause all around (from the 2 people who stuck around all these years waiting for a new post). As for the reasons I failed at blogging the first time around and what I can do to succeed this time, that will be the subject of a future post. As a first step in the reboot, I decided to migrate my blog off a self-hosted Pebble/Tomcat setup and onto a free hosted blogging platform where I won't have to spend time and effort on maintenance and software/security updates. This will hopefully free me up to just focus on blogging. After an admittedly shallow search, I decided to give Blogger a try this time around. After going through the migration, I thought I would share what I like and dislike about Blogger so far. This list primarily focusses on my migration experience, configuration and first impressions. Given this is my first post on the Blogger platform, I haven't actually used the blogging features much yet. Here goes. It's free to use with a custom domain registered through Google Domains. Using my own domain name was non-negotiable for me. The fact that I could easily do that for free with Blogger + Google Domains (where all my domains are already registered) made it a win over other hosted blogging platforms. Blogger integration with Google Domains is nice. DNS configuration for my blog was simply a checkbox in the Google Domains admin which created something Google Domains calls a synthetic record. The rest of the the configuration was within Blogger itself. I can configure redirects. Some of the legacy Pebble urls needed to be changed to be compatible with Blogger. Broken links would have been a deal-breaker for me. Blogger allows you to specify whether the redirects are temporary or permanent. Also, query string parameters are maintained through Blogger redirects, which is a plus. I can make "pages". ie. static web pages that aren't blog entries per se. e.g. About me. Pages are not dated and are not included in the RSS feed, etc. The pre-fab templates look pretty good, are mobile-friendly out of the box and there were multiple template choices that suited my minimalist preferences. Adding widgets to the sidebar was straight forward. I was able to easily add my StackOverflow badge and Twitter feed. Adding Google Analytics tracking was as simple as pasting my GA ID into a text box in the settings area of the Blogger admin. I had to change the canonical domain for my blog from the naked domain to www, which wasn't a deal breaker for me although I would have preferred to stick with the cleaner looking naked domain for the canonical url of my blog. At least Blogger provides a checkbox to redirect the naked domain to your chosen subdomain, www in my case. The most likely reason for not supporting naked domains is that a large scale platform such as Blogger probably has all custom domains resolve to CNAME records pointed to load balancers. These CNAMES resolve to the most optimal load balancer for the requested location. The DNS protocol doesn't support specifying CNAME records at the zone apex. Therefore, naked domains can only use an A record which can only point to an IP address. (and optionally an AAAA record pointing to an IPv6 address). Some DNS providers support CNAME-like functionality for naked domains. This is achieved by the DNS service dynamically resolving the CNAME on the fly and responding with an IP address as though it were an A record, thereby making the whole thing transparent to the client. Amazon calls these Aliases and Cloudflare calls it CNAME flattening. Still others call it an ANAME. But Google Domains doesn't seem to have this feature under any name at the moment. You can't support https with a custom domain. Again, this was not a deal breaker for me as my legacy blog wasn't being served over https anyway. But given the recent trend towards end to end encryption on the web, and efforts to provide free SSL certificates such as LetsEncrypt, it would be nice for Blogger to offer a solution, free or otherwise. If I do want to get this blog on https, I might have to migrate off Blogger. (Proxying through Cloudflare might be an option). Importing my content was a pain. Fortunately, there wasn't much of it. I had only ever published one blog post which received a grand total of 4 comments. Blogger does have blog import/export support for posts and comments, but the only supported format is Blogger's own XML format. Pebble didn't seem to have an exporter for this Blogger XML format so I ended up cut/pasting my blog post, the 4 comments, and the pages I had created into Blogger's web interface. I then used the Blogger export tool to export the XML so I could spoof the authors and dates of the comments directly in the raw XML and re-import it back into Blogger. It took me several rounds to get all the timestamps/timezones right. I ended up hitting a rate limit on the import function, which forced me to wait 24 hours before attempting another import. The URL paths and slugs that Blogger allows for posts didn't line up 1:1 with my legacy blog stack's paths so I had to set up redirects in order to not break any URLs. I also had to backdate the date portion of the path to match the actual date I published the original on the legacy blog stack. This manual tinkering obviously wouldn't have scaled beyond a small number of posts and comments. The auto-generated sitemap.xml includes blog posts but not "pages". I wanted to add them manually but I can't see any way to edit or override the auto-generated sitemap.xml. 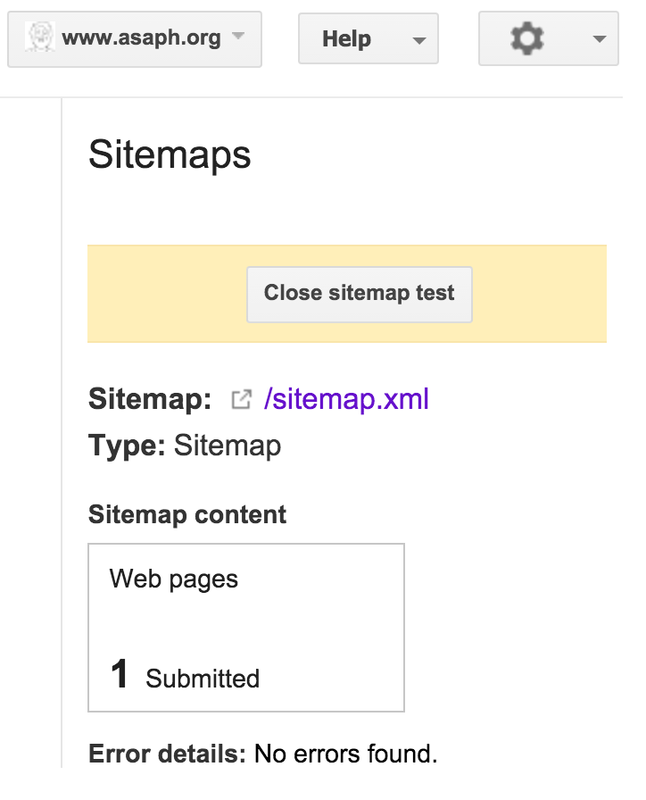 I guess the pages I created won't be in my sitemap :( Also, sitemap.xml is being served with Content-Type of application/atom+xml which I'm not sure is valid, although Google's own webmaster's tools considered the sitemap to be valid. 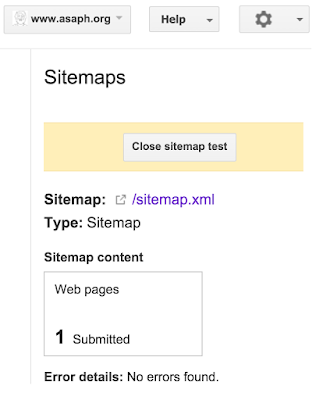 Update 2106-04-07: Blogger's undocumented pages feed can be submitted to Google Webmaster's Tools as a sitemap in addition to the auto-generated sitemap.xml. Thanks for the tip @prayagverma! The custom redirects are limited to internal urls. Some of the redirects I wanted to set up were to outside sites such GitHub repos I have created but I wasn't able to make them work. There may be a sound reason this is restricted, but it was still a let-down given my non-sinister use case. Though it's imperfect, overall Blogger feels like an upgrade from my self-hosted Pebble stack. So I'm pleased. And now it's time to stop messing with the blogging software stack and start actually blogging!